Jan. 7, 2016 – Singapore – MotionElements, Asia’s go to marketplace for royalty-free stock media, will launch AudioSearch, a tool that for the first time makes it drag-and-drop simple for creators to find the perfect music to use in their projects, on January 11. In seconds, advanced algorithms analyze the rhythm, structure and chord progression of a song. Based on this, it returns dozens of relevant results from MotionElements’ catalog of more than 170,000 royalty-free songs and sound effects. 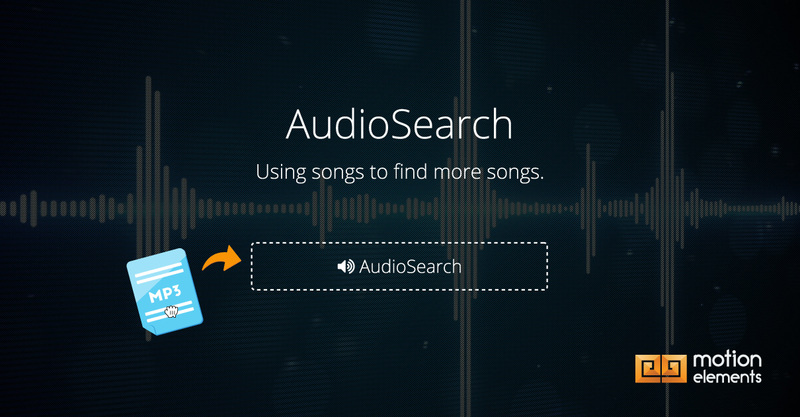 Users can also use AudioSearch to find songs similar to one in an existing set of search results with a single click of a search icon. AudioSearch has already undergone an enormous beta test, with more than 30,000 audio and video professionals invited to participate over several weeks. Early feedback has been overwhelmingly positive. AudioSearch uses an artificial intelligence technique known as deep learning, which has also been applied toward recent breakthroughs in object recognition, natural language processing and speech recognition. This level of technology is made necessary because music understanding is much more complex than more established disciplines like image recognition. To try AudioSearch before the public launch on January 11, 2016, journalists can visit http://www.motionelements.com/audiosearch. This landing page provides additional information on how to get the most out of AudioSearch. After it launches, AudioSearch will be easily accessible from the front page of the website. In conjunction with the launch, MotionElements will host a contest on its Facebook page (https://www.facebook.com/motionelements) and Twitter (https://twitter.com/motionelements). Visitors can win $300 in MotionElements credit by liking the MotionElements on Facebook or following @MotionElements on Twitter, and sharing the post that officially announces AudioSearch. Two weeks after AudioSearch goes live, MotionElements will randomly select three entrants to receive $300 in MotionElements credit. Winners or their companies may also be profiled on the MotionElements Blog (https://www.motionelements.com/blog/). MotionElements is Asia’s go-to site for royalty-free video, and allows video professionals to connect, create and earn. Having become Asia’s leading microstock marketplace for video makers worldwide, MotionElements offers a fully localized experience for stock media buyers and sellers. Video creators and music makers use clips from MotionElements to affordably enhance their creations. Coming from a creative media background, the founders at MotionElements understand exactly what is salient for video makers. The marketplace offers over 900,000 motion assets including stock videos, music, 3D models, Adobe After Effects and Apple Motion templates. With more than 3,000 registered contributors from around the world, MotionElements’ collection of stock media doubles each year. The company has attracted venture backing from high profile funders including KK Fund, Incubate Fund and 500 Startups.